HA NOI (VNS)— The Viet Nam National Oil and Gas Group or PetroVietnam failed to meet its financial targets in the first quarter of this year. The failure has been blamed on the fall in global oil prices. PetroVietnam reported a first quarter revenue of just VND64.5 billion (almost US$3 billion), equivalent to 72 per cent of the quarterly target and only 18 per cent of the whole year's plan. Its after-tax profit was VND9.4 trillion ($435.2 million), equivalent to 77 per cent of the first-quarter target and 23 per cent of the yearly goal. The whole group, including the affiliates and subsidiaries, earned VND132.2 trillion ($6.1 billion) in revenue, 81 per cent of the quarterly target and 18.4 per cent of the goal set for the whole year. PetroVietnam said the global oil prices continued to fall steeply in the first three months, averaging $56 per barrel at the end of March, which was a 50.4 per cent fall compared with the first quarter of last year ($113/barrel), and equivalent to just 56 per cent of the group's price plan ($100/barrel). The price of "black gold" is currently about $56 to $58 a barrel in the world market. This has had negative impact on the group's production and business plans in 2015, as well as its contribution to the State budget in the first quarter. PetroVietnam contributed VND28.5 trillion ($1.3 billion) to the State Budget in the three months, only 79 per cent of the Q1 target and 18 per cent of the year's plan. However, it had good results with respect to other business targets. Its industrial production value reached VND125 trillion (US$5.8 billion) in the first quarter, 12 per cent higher than the quarterly target and equivalent to 28 per cent of the yearly goal. This figure was also a 6.3 per cent increase year-on-year, which contributed largely to the country's GDP growth of 6.03 per cent between January and March. 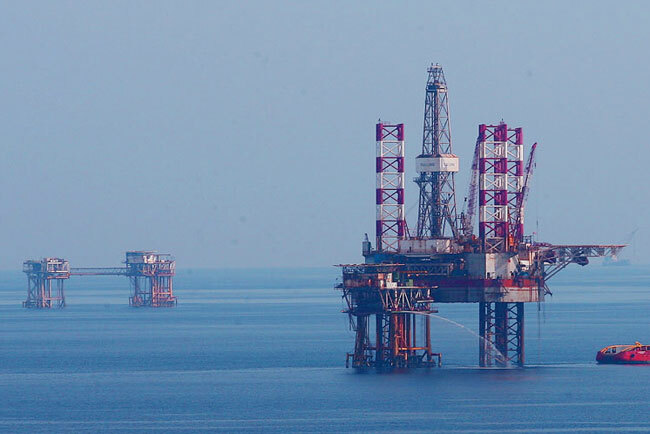 PetroVietnam produced 7.21 million tonnes of oil, exceeding the first-quarter target by 7.6 per cent and equivalent to 21.7 per cent of the yearly plan. The crude oil output reached 4.61 million tonnes, surpassing the target by 10.4 per cent and up 8.2 per cent year-on-year. Gas production touched 2.6 billion cubic metres, up three per cent compared with the target, and equivalent to 26.5 per cent of the annual plan. The group's oil and gas reserves also increased to 4.83 million tonnes of oil equivalent, equal to 13.8 per cent of the whole year's target. The production of power, fertiliser, petrol and fibre also surpassed the three-month targets and registered increases between six and 49 per cent, compared with the same period last year.